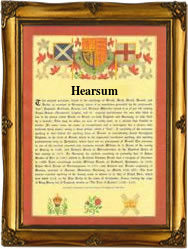 Recorded in many spelling forms such as Hearson, Hearsen, Herrsent, Hearsum, and Hersane, this is an English medieval surname, although it could be said to be of pre 7th century Olde German or French antecedents. It derives from any of the popular personal names Harry, Harold and Henry, and is therefore a nickname patronymic. Its most popular English and Scottish spelling is "Harrison", although the spelling we have here with this surname is one of the rarest examples. It is first recorded in the 16th Century, although dialectally "linked" to 14th Century examples such as John Hennerisone, in the 1354 Cheshire Pipe Rolls, John Herryson of Huntingdon in 1374, and John Harryson of Sheffield in 1454. The later examples include John Hersane of Blackfriars, London on September 21st 1585 and Jacob Hearson, of St. Dunstan's, Stepney, London, recorded on November 28th 1644. The first recorded spelling of the family name in any form is probably that of Henry Herrissone, in the London charters, known as "The Please", for the year 1354. This was during the reign of King Edward 111rd, known as "The Father of the English Navy", 1327 - 1377. Surnames became necessary when governments introduced personal taxation. In England this was known as Poll Tax. Throughout the centuries, surnames in every country have continued to "develop" often leading to astonishing variants of the original spelling.